On Monday afternoons this fall, after the school day has ended, a group of Westfield teachers meets in a room at Westfield High School to further their own education. It is a 3-credit graduate course called Teaching the Holocaust and it is the 4th time the course, along with a spring 3-credit offering entitled Teaching Prejudice Reduction, has been presented in the Westfield Public School District. The first semester runs from September 17 through December 3 with the graduate students meeting once a week for 2 ½ hours. The second semester begins in January and continues through early May. The instructor for both courses is Karen Stark, an adjunct professor at Kean who taught at Westfield High School for 35 years. 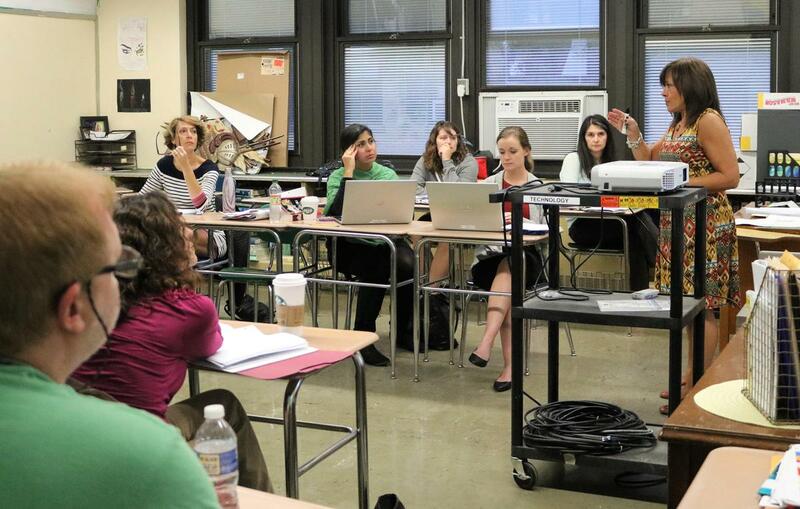 “These courses are intended to equip graduate students with information and teaching strategies to help them implement the state-mandated requirement for Holocaust/Genocide instruction for grades K-12 in New Jersey public schools,” says Stark. In 1994, New Jersey passed a law requiring that the teaching of the Holocaust and genocide be included as part of the curriculum for all students in kindergarten through 12th grade to learn about issues of bias, prejudice and bigotry, including bullying. Brennan says the curriculum at the elementary level focuses on building capacity for empathy as students learn about prejudice, stereotyping, and discrimination through fiction and non-fiction stories about children who are excluded and how it affects them. Content specific lessons on genocide and Holocaust issues occur in 8th, 9th and 11th grade social studies classes as well. For example, Brennan says, an 8th grade unit on American Expansion includes examination of the treatment of minority groups and, in 8th grade Language Arts classes, students read Boy in the Striped Pajamas and The Book Thief to provide additional clarity and context for what happens when human rights violations are perpetrated. At Westfield High School, the Holocaust and genocides are explored in depth in a variety of course offerings including Global Perspectives, Exploring Global Studies, Humanities, U.S. History II, American Studies, and AP U.S. History, while Comparative Religions, AP Psychology, Anthropology, and other electives explore many topics related to persecution, propaganda, and racial intolerance. Assemblies at all grade levels also follow up these classroom experiences. During the fall Kean graduate course, Teaching the Holocaust, the teachers enrolled in the course use various texts and media to explore teaching strategies, course content, and curricular materials that meet age-appropriate learning objectives. Stark also provides strategies for her students for reading complex historic text and creating evidence-based writing samples. Teachers enrolled in Teaching Prejudice Reduction in the spring will examine topics such as race, ethnicity, discrimination, bullying, and preconception with an emphasis on approaches to reduce the role of prejudice in their students’ lives and to prepare them for 21st century life and careers. “Teachers will learn methods of incorporating prejudice reduction into daily instruction and curriculum development,” Stark says. The Holocaust Resource Center at Kean University can be reached at (908) 737-4632.